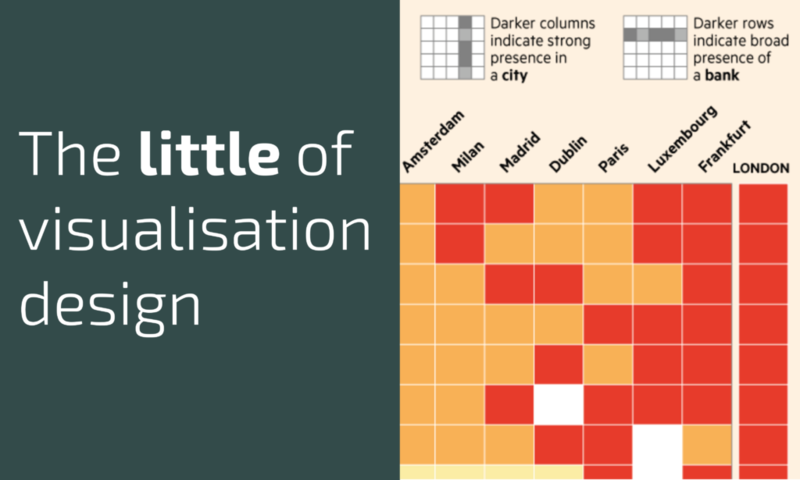 The 'little' of this next design concerns the use of reading guides to help the reader understand how to interpret the meaning of a heatmap display. 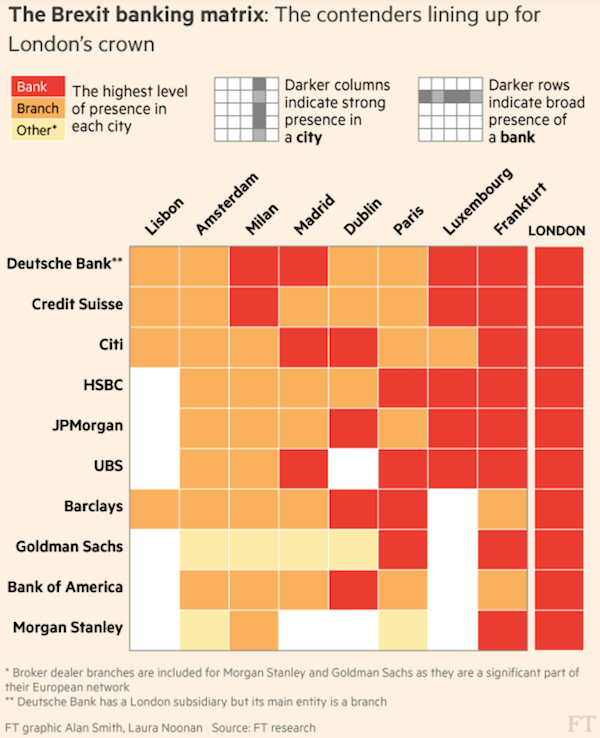 The project in focus here was produced by the Financial Times and from an article titled 'Frankfurt vies for UK banking jobs post-Brexit' and shows analysis of the presence of different banks across a range of major European cities. To some readers, the task of parsing meaning through the colours at the intersection of two categorical variables can be a little tricky. Knowing this, the creators include a small guide above the chart (and therefore, through its placement, intended to be seen before reading) that quickly indicates the interpretation to draw from seeing specific patterns down each column and across each row. At first, I must say that it took me a few seconds to really grasp the meaning and implications of this heat map. But I came to the same reasoning as the one explained in the “reading guide”, which proves its usefulness. However, I wonder: is there any other type of chart that would have been more appropriate than a heatmap? Or alternatively, what changes would you have made to make it even easier to understand? Hi Benoit, I’m not sure there are many ways of making it easier, actually. Sometimes the analysis you’re displaying is inherently complex (eg. relational, as in this case) and beyond the scope of easy/familiar chart types. An alternative could be the Sankey diagram but I feel that would reduce the clarity so it’s one of those where we (readers) have to accept a bit of perceptual legwork! Your explanations totally make sense. Thanks for following up!